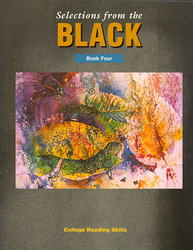 Selections from the Black enables the mature reader to experience authentic voices in literature while building crucial reading, vocabulary, and study skills. Diverse reading selections. Authentic voices of the black experience—past and present, moderate and bold—in their original forms. Original works. Develop reading understanding through relevant topics from unedited and unexpurgated selections. Reading–strengthening exercises. Strengthen student comprehension through exercises designed to improve vocabulary and study skills. Multiple levels. Reading levels—ranging from 6 to 12+—encourage students to read at their specific level.